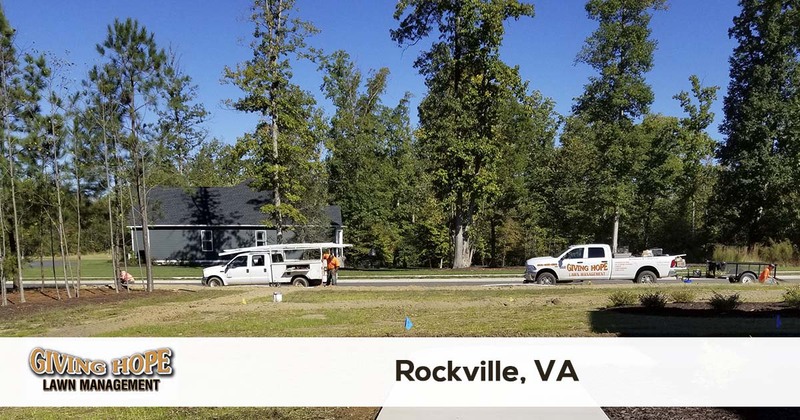 Giving Hope Lawn Management is proud to serve the community of Rockville with professional lawn care and landscaping services. For more information or to get a free quote call us today at 804-839-8340. What’s funny about Rockville, VA, is it sounds like a city from The Flintstones. But what some residents may not know is that it remains named after one of the original postmasters. But in some ways, living in our community may still feel like remaining stuck in the Stone Age. When you need quality landscaping services, for instance, it seems impossible to find a reliable choice. That’s why, for the top name in Rockville lawn care, you can always trust your yards to Giving Hope Lawn Management. Since 2011, we remain the affordable choice in complete landscaping solutions! Whether you need someone to trim bushes and mow grass each month, or you need help installing irrigation systems, our team offers complete lawn care services for less. There’s no need to fret about maintenance costs when you hire us for your job! We offer affordable rates for monthly landscaping services, as well as one-time projects and new construction services. Whether you need better yard drainage, rough grading, or mulch installation, we offer it all at lower costs! Choose us for all your landscaping needs. We guarantee only the best results each time! When you can’t trust your yards to just anyone, make sure you’re hiring the reliable company. Call us today and start enjoying your yards again! Giving Hope Lawn Management is the industry leader for lawn care and landscaping in Rockville. We offer a 100% satisfaction guarantee with all of our services, so there is no risk for you to give us a try. Give us a call today for the fastest service at 804-839-8340.